At the recent County Council Meeting which set the new budget increase of 1.99% I was absolutely disgusted with the attitude of our Conservative members. I poised a possible saving just by looking at Adult Social Care and the money we paid to outside agencies. The reaction was that I was accused by the leader Martin Tett of crash and burn. The councillor for Wing suggested that the increase in council tax did not make a difference to any one. This is an increase in successive years and although not a large amount it does make a difference to some of the residents on mine and other areas in Aylesbury. The meeting degenerated when we were heckled by several Conservative members that we were supporters of HS2. A fact that simply is not true. 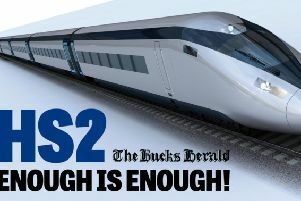 The problem is that the Tories do not know their HS2 from High Speed Rail. There appears to be an arrogance at both a local and national level. Certainly our PM with his stance on HS2! Jeremy Paxman said recently that Winston Churchill would not fit into modern day politics. He said he was very arrogant, a chancer and a charlatan. On that basis I would have thought he would be perfect! I am glad to see bollards are being added to the junction with the bypass. You presently have to gauge the entrance at night by a small 40 mph speed limit sign just after the junction. However I think that a much greater safety feature would be to make this junction left turn only. The road is now too busy and wide to be safe most of the time to turn right. Some people sit there for 5 or more mins before they can get across. They were going to put a central isle along this section but nothing has been done. Someone will get hurt or killed one of these days turning right if the pot holes along here don’t get them first. Presumably the gentleman my wife and I saw urinating to the side of the recycling bins in Cornwalls Meadow car park on Monday morning assumed that the long-awaited-for toilets had at last been built? I was appalled, and read with disbelief the proposed revised charges by AVDC at the Exchange Street car park, in Aylesbury. These new evening charges are obviously and purposely directed at theatregoers mainly and also at persons dining out in the evenings. This is a cynical move to disadvantage those persons the Council professes to encourage into the town centre at night. The council admits that the theatre brings huge amounts into the local economy, but still they are not satisfied. The subsidy to the theatre is also considerably less than that spent to keep the old Civic Centre afloat. They boast about the car park being free after 9 pm – big deal! None of the other town centre car parks are having these new evening rates applied, which makes it even more obvious who is being targeted. The current £1 charge will, in most cases, increase to £3.50 and if one wishes to partake of a meal prior to a show it will rise to £4 or more. So much for encouraging people to use the theatre and the new, and proposed, restaurants. I really do despair at the lack of foresight and tunnel vision of these people. Do they really not realise that this action is a deterrent to the very people we wish to attract to the town centre at night. I hope that the Chief Executive of the Waterside Theatre, plus other ATG staff with influence, and all the town’s restauranteurs, make strong representation to the Council in a combined effort to get this unfair and idiotic proposal relegated to where “the sun doesn’t shine!”. It’s time to stop changing clocks. I know this isn’t a specifically “local” issue like the majority of letters which I enjoy reading each week. 1) We will exercise more. Who knew? It seems that leaving the clocks alone adds hundreds of active hours to our year, hours that we will (naturally for some – with conscious effort for others) spend burning calories and getting more exercise. Excellent. Research shows that we feel happier, have more energy and are sick less often in the longer days of summer when we are exposed to more light. Our moods and health may also show decline during the darker days of winter. Isn’t that a great positive psychology based reason to go back to the normal, natural cycle of light our planet has? The NHS represents the most civilized of principles, and should be funded appropriately, the moral of the front line staff can be directly related to their performance, and the experience of those under their care, this should be considered before any interest in profit. The following letter was printed in last week’s Advertiser and signed off as being from Ian McPartlan, Parent Governor, The Buckingham School. I have two children, now aged 21 and 19. My daughter attended Buckingham School when it was struggling, however I am pleased to say that she finished University last summer and achieved a First Class Honours Degree in English, so although the school itself was struggling then and has come on a long way since, she is one example of where the school did her proud and encouraged her to reach her potential, especially her English teachers. My son attended the Royal Latin and he is currently at Durham University , both schools are good in my opinion so it doesn’t matter which school your child goes to we should be proud of them both. It didn’t do my daughter any harm going to Buckingham School as her results have proved. As the election grows nearer, people are now starting to think more about how our nation is managed generally and how it affects us all, personally. Prof Timothy Congdon has done a full and comprehensive in-depth study on the cost of belonging to the EU and it may surprise many of your readers to learn that for the pleasure of belonging to this very restrictive Club – which has an unelected Committee to run it – costs us all an eye-watering £185 billion per year ! This works out at around £8,000 per household, per year. Had we not joined, we would have no national debt. Readers should bear this in mind when voting. Ten years ago this Thursday the Hunting Act came into force. It was intended to end the cruel and barbaric ‘sports’ of using trained packs of killer dogs to chase and savage wild mammals to death, for the pleasure of a sick minority who form themselves into gangs called Hunts. Whilst the Act was a hugely important symbolic victory for the cause of animal welfare, it has proved, in practice, to be of little real utility in restraining the bloodthirsty activities of these gangs, who continue to ride roughshod over the spirit and letter of the law, much as they promised to do before it was enacted. This is largely because weaknesses and loopholes in the Act itself have allowed this. What the hunters are still permitted to do looks so like traditional pursuit of quarry that it is extraordinarily hard to produce evidence to convince police and the CPS, still less a court, that any observed chases are intentional, not the ‘accidents’ that Hunts pretend them to be. Hares, foxes and deer continue to suffer from the hunters’ arrogant callousness. Even on the rare occasions when organised hunters are convicted - just 32 in a decade - the sanctions are trifling, clearly providing no real deterrent. No less an authority than the Chief Inspector of the Crown Prosecution Service has told the RSPCA that flouting of the law by Hunts is widespread - and senior police officers and judges have commented on how hard it is to interpret and enforce. 80% of the public - urban and rural - want the Hunting Act retained, but also want a law that works properly. This can only be achieved if the Act is significantly toughened up, as sought by www.campaigntostrengthenthehuntingact.com . Please support that, urge MPs and candidates to do the same - and vote for a party that will uphold and extend the welfare of wild mammals. not seek to destroy what little protection they have to please their own red-coated pals.